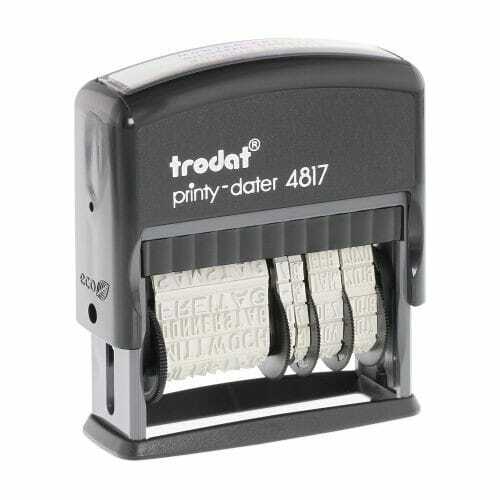 Trodat Printy 4817 comes ready-to-use with 12 frequently needed phrases:ANSWERED, RECEIVED, ENTERED, BACKORDERED, E-MAILED, PAID, CANCELLED, CHECKED, SHIPPED, BILLED, DELIVERED and FAXED. Just turn the wheels of the band and select your required phrase. The text prints in front of the date. The date has the height of 5/32" (3.8 mm) and the format: month (in letters) day and 12 consecutive years in figures. Size of the imprint is 5/32" x 1-7/8" (3.8 x 47 mm). Customer evaluation "Trodat Printy Dater 4817"